Ibrox Noise: What went wrong at Ibrox tonight? What went wrong at Ibrox tonight? We’re not going to say too much in this piece – we’ve been heavily critical of Steven Gerrard and some of the players when things have gone wrong, and while we can question some of tonight’s selections, we have to praise Gerrard’s balanced, fair, honest and candid post-match reaction. No defence this time of Alfredo Morelos, who let his club down again. Disappointment that his players didn’t deliver on the gameplan he’d set out. Concession that discipline is a real problem with this team, and it’s something we discussed here on the site only a day or two ago. And absolutely no complaints about the result. 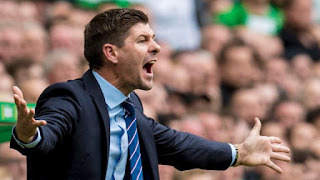 We can debate all day whether Gerrard picked the right team – but whatever we think, Aberdeen have just won for the second time at Ibrox in 30 visits, having for the first time in six away matches managed to keep a clean sheet. Derek McInnes has outfoxed Gerrard two matches in a row now, in more or less the same way each time – meaning either Gerrard is correct that his players didn’t follow his orders, or that his orders were wrong in the first place. Either way, a bad night, tempered slightly by Celtic also slipping up to Motherwell. It’s a slight get out of jail card, and we can’t remember the last time Kilmarnock ever topped the table. So… make of tonight what you will, and feel free to in the comments, but we’ll sleep on it. Everything! Everyone was shocking! Barisic should be back by now! Tav was woeful! Do we really need 2 defensive midfielders at home?? Ejaria is the least creative attacking midfielder I've ever seen! Wingers couldn't cross the ball! Strikers beaten to the very few balls hit in their direction. Grezda should start! Halliday should have been brought on as a midfielder because he can actually make a forward pass or have a strike at goal! We NEED Davis back as soon as the transfer window opens. I never leave early but I was really tempted to go at halftime...I wish I did! With no midweek commitments in Europe Kilmarnock can do the business. A loss to Vienna might give our League prospects no harm. McInnes won this game. Rangers were done after the first few minutes and make no mistake every other team will take a leaf out of his tactics. clueless going forward. no creativity at all. crying out for a creative midfielder and midfield runners. throwing long balls up to Morelos first half versus two big centre halfs was pointless. whole team got far too caught up in giving fouls away and pointless bookings sending off was bound to happen. big chance missed tonight. mainly down to indiscipline team needs to grow up and fast. loan players out ,even i know halliday is better left back than flannigan,even i know goldson should never be on left hand side defence, mr gerrard helped the sheep tonight ,refusing to play our best players .think murty record in scotish football is better than mr gerrards ,and murty got 15 bob to spend ,mr gerrard got 15, million , coulabally, ejaria , come on . I told you about the stuff you wrote over the last couple of days about getting us carried away but you and everyone else had the blinkers on again. Are we still shouting on Morelos not to change his game because if we are we are in big Soapy Bubble. We need to be realistic here we are in a good position but let's not blow our own trumpet while blowing the lead at the top. Are we to believe killie are the best team in Scotland now you put that out there the other day when we went top again set up for another fall. Let's just calm down now and take it easy. We will move top again at some point but please ease of on the crazy predictions. A hope you post this as it is a fair comment mate. We'd love to hear what crazy predictions we've made Scud? Maybe not a prediction, but you wrote in the article about "Mc Innes quaking" that "Aberdeen haven’t won v Rangers in the last five attempts" and that "Rangers might not yet be quite back to our former glory, but the hoodoo Aberdeen have suffered against us going back effectively 30+ years remains very much in place". Eh, didnt you notice them beating us in the League Cup Semi?? Didn't you notice that we hadn't beaten them in 3 games up until last night??? Make that 4 now..... I'm all for bigging us up, but sweet jesus at least do it based on the facts. Well mate for a start you said keep Morelos playing the way he is aggressive don't change it are you and others still of this opinion because that is only going to cost us big time. The statement being back at the top of the league and the best in Scotland we ain't you need to admit to that. Putting it out there 20 to 30 million for Morelos who is going to go e us that kind of money going by his discipline record. Do you think a team will pay that kind of cash out for him to be suspended every other week no mate that ain't going to happen. You left Aberdeen without a name yesterday laughing at them in 7th place we should be putting our own house in order before we judge others. So let's calm down reflect on the result and take it one stage at a time and let's start to walk before we can run. William, that was a league stat piece, not overall. Scud, we can now see why SWH has a problem with your misinformation and misrepresentation of our articles and other aspects of your posts. We'll consider this. I did warn at the weekend that we still have a way to go and tonight just confirmed that. Let's not over react after tonight as there will be bumps on the road along the way but we are getting better. There are some issues regarding our attacking play that need to be addressed but Im confident we will in January. Still gutted though. -We all know that with Dorrans and Murphy out we lack an AM if Arfield is not there or not on his game. But are we really all shocked that SG doesn't have a magic wand? That he hasn't fixed everything in one summer? That it was going to be that easy? SWA these are all Stevie G players you have spoke about so what do you suggest throw more cash at him to bring in more of the same. You say he does not have a magic wand correct as these things take time what are you expecting instant success instant magic a don't know you tell me as you appear to have all the answers. I'm not really sure what your point is. You say they are all SG players - Dorrans and Murphy were here last season. The second striker we need is because Lafferty isn't good enough. Yes, SG brought him in. He is ok as backfill but not goods enough to lead. But came at the end of the window when he clearly couldn't find anyone better. Mark Allen has now had another 3 months to look. Very confused by "You say he does not have a magic wand correct as these things take time what are you expecting instant success instant magic a don't know you tell me as you appear to have all the answers"
I really don't unbderstand what that means. In agreeing with Robrob, I think a lot of people can identify some of the commonly held problems. I do not claim to have all the answers, but in common with most people think another good striker and a creative midfielder would be a very good place to start. I am not expecting instant success. I think SG made a great start in the summer and brought in 15 players of whom only 1 has really not worked out. The next window I think he will aim to bring in players who are better than those already there, which will improve the team and squad. The difficulty will be in getting rid of some unwanted players, but I expect them to be working on that too. It will be a gradual and continuous process from here on in, rather than the large scale transformation of the summer. Not sure if that is what you wanted me to tell you, but there you have it. As always, I look forward to seeing your suggestions - do you have any? It's simple - Too many heartless bottlers like Tav, Candieas and so on who I'm sick of seeing struggle the minute the game requires a bit of leadership and desire. And too many Loan players(you cant build a winning mindset,a winning mentality and a winning team with loan players in the most important positions in your team team). For me the armband would be given to Mcgregor and Tav and others devoid of heart that can't be relied on would be gone! Teams don't win things with these types. Never have, never will. Would we lose much quality by swapping for instance Worral with Mcrorie, Halliday with Ejaria, Docherty or Rossiter with Coulibaly, young Dallas or Mebude etc with Sidiqi? I personally don't think we would lose much quality but i think we would gain more in terms of unity, heart and desire to win, which is something we are clearly lacking! P.S - Two defensive midfielders at home is Sam Allardyce football! I think a lot of us saw this coming after about 20 minutes. The sheep had a game plan of 'throw yourself to the floor at every opportunity and we'll try and nick a goal from a set piece'. Once they had that, we were struggling. Too many of our players are happy to pass side to side to make their pass completion stats look good. How many times did we have players on the edge of the box, waiting to lay the ball back for a shot, play a one-two or turn and shoot? Did the ball ever come? No. Side to side, same as last year. None of our midfielder's are prepared to drive forward to make things happen. Living in Thailand, I stayed up for a 02.45 start but went to bed 5 minutes after Morelos got his stupid, stupid, stupid red card! We were never going to score with 11 against 10 so no chance with 10 aside. I don't know if you saw Gerrards post match analysis but he was absolutely livid that players never played to the game plan. Given how protective he has been in the past then I have no reason to disbelieve him. But judging by his demeanour I suspect it won't happen too often in the future. Let's hope so because we have to eradicate these inconsistent results and players have to know that they must follow instructions and are not bigger than the club. Tonight shows were still 3 more quality players away from challenging for league. But couldn't be happier with the man in charge. It's only a matter of time. On the subject of Barasic and Kent where the hell are they? I got the impression they would be out for a few weeks but here we are still waiting for them to get back. It seems to me that our players are out injured for 3 weeks but don't play again for 5 or 6 weeks. If they're fit get them back in there and stop mollycoddling them!!! Still waiting for you to put up your £20m Scim. SCIM, please buy out King and lead us forward to the promised land. We will acclaim you our saviour. But.... why haven't you already done it? Said before the game Morelos will be sent off tonight. Based purely on the attack by Levein, thre jack of backbone in referees and Morelos being an absolute indisciplined fool. Gerrard set it out wrong. We MUST find a creative midfielder. EJ is light not strong enough for this game. Tav WTF why is he taking all these crosses. We need guys who can deliver a final ball. Lafferty should have been on from start. Flanagan, why are we not playing Halliday there. He has to continually cut backto get the ball on his right foot. Not good enough. Why was McRorie not playing. Ideal game for him. I'm at a loss. We had a chance to eliminate the game in hand over us. We messed up totally. Not good enough. Steven Gerard made two bad decisions last night. If the Croatian left back wasn’t fit then Lee Wallace should have played, he can also score goals and when Morales was booked then he should have been taken off because we knew the Aberdeen players would wind him up. There must be punishment benchings, because I think this team is quite frankly,'taking the piss.' Morelos has discipline issues. Plain and Simple we were Pish! 5. If Barisic isnt Fit ...Wallace Plays! Love your plan mate right behind it all that will cost a lot of dough and a don't know that goes about sending loaned players back though we may be stuck with these damp sqibs until the end of the season mate no surrender. 6)Agree if we can return Coulibaly and we can't sell Rossiter until he plays. Who to? With that performance and a severe lack of discipline does anyone believe that this team are contenders to win anything in the next ten years.